Louise found this picture of us on the day we left college. We would like to tell you that we are delighted to have grown up. 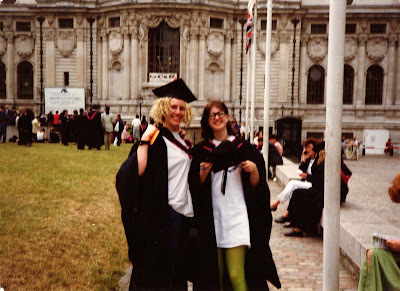 Back then, we hadn't a clue what we were doing, which is apparent by my first push up bra under an extra large Sonic Youth T shirt, and Louise's lovely green tights, which were actually joined to a pair of platform leopard skin flip flops.